Click here to view videos of the authors talking about Words Their Way! 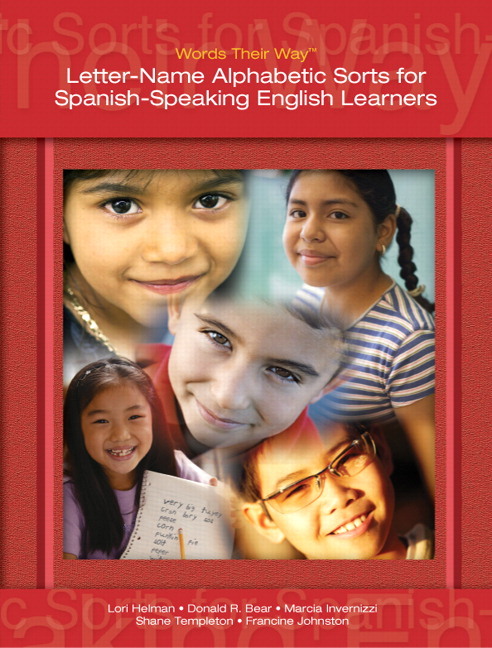 Words Their Way® Word Study for Letter Name-Alphabetic English Learners: Letter, Picture, and Concept Sorts for Spanish Speakers is a new text providing strategic assistance for teachers working with native Spanish speakers. Based on the same solid research and using the same scope and sequence laid out in Words Their Way® with English Learners, this companion volume begins with a series of picture concept sorts that teach students how to sort, providing guidance to help teachers make sorting meaningful. The text develops a routine for introducing the English vocabulary, helping students learn the vocabulary before they sort. The words for study are selected based on their phonetic properties as well as their usefulness in reading, speaking and understanding grade level content. The text addresses the needs of the letter name-alphabetic speller, whether young or not so young. The text is careful to include sorts more appropriate for older learners, as well as advanced EL students needing more concept and vocabulary support. What does the field have to say? This text is an addition to a well-known and highly successful series. The research base is well documented and the teaching strategies are classroom proven. It doesn’t get any better than that. I was very excited when I saw the title of the book, and even more interested as I looked through it. I think this is a valuable addition. Loriis associate professor in literacy education in the Department of Curriculum and Instruction at the University of Minnesota. Her research and writing have focused extensively on the reading and spelling development of students learning English as a new language, including other Words Their Way® instructional materials for English learners. She has also edited a text for teachers, Literacy Development with English Learners. Donald is director of the E. L. Cord Foundation Center for Learning and Literacy where he and preservice, Master’s and doctoral students teach and assess children who struggle to learn to read and write. Donald is a professor in the Department of Educational Specialties in the College of Education at the University of Nevada, Reno. Donald has been a classroom teacher and he researches and writes about literacy development and instruction. He is an author of numerous articles, book chapters, and books, including Words Their Way®, Words Their Way® with English Learners, and Vocabulary Their Way. Marcia Invernizzi is Director of the McGuffey Reading Center at the University of Virginia exploring developmental universals in non-English orthographies. A former English and reading teacher, Marcia works with children experiencing difficulties learning to read and write in intervention programs such as Virginia’s Early Intervention Reading Initiative and Book Buddies. Francine Johnston is Associate Professor in the School of Education at the University of North Carolina at Greensboro, where she teaches reading, language arts, and children’s literature. A former first-grade teacher and reading specialist.